Catherine and Pierre Breton make great wine with such integrity makes our appreciation of them complete. The Bretons farm eleven hectares of vines just east of Bourgueil in the village of Restigné. The Bretons first introduced biodynamic practices into their viticulture in 1994, just after receiving their organic certification in 1991. Recently, they started the three-year process of seeking biodynamic certification. In fact, they have become international icons for the natural wine movement in an area where the climate and soil can make organic viticulture difficult. “Trinch” is named after a German expression meaning “cheers” championed by the poet and philosopher Rabelais. 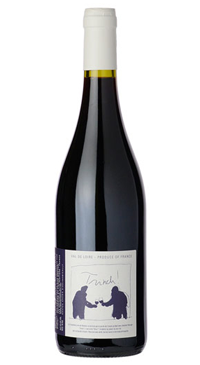 Trinch is a Cabernet Franc from younger vines growing on gravel soil. It is vinified in stainless steel with a cold maceration. It is made for early consumption and typically has very accessible fruit, soft tannins and low alcohol. Bottled in the Spring after harvest.